[T]hose of us with health insurance are also paying a hidden and growing tax for those without it -- about $1,000 per year that pays for somebody else's emergency room and charitable care. A common myth is the belief that the uninsured use the emergency room a lot more than people with private health insurance. Yet as the figure shows, the percent of uninsured going to hospital emergency rooms every year is not much higher than for those with private insurance. (And after adjusting for health status, there is no difference in the average number of visits.) 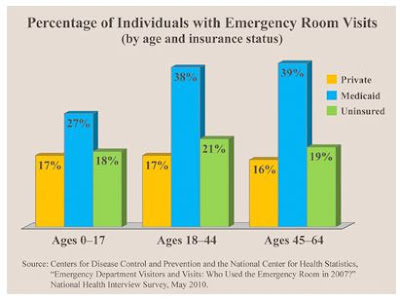 Medicaid enrollees, on the other hand, visit emergency rooms significantly more often than either the insured or the uninsured. Why is that? The main reason appears to be that Medicaid fees are so low that patients have difficulty finding private practitioners who will see them. Often, the emergency room turns out to be the only place they can access care. Studies show that even the uninsured have an easier time making doctors' appointments than Medicaid enrollees. Perhaps next time, Democrats will "read the bill" first. Or Republicans will repeal it. It's not just an idea.